The gorgeous, warm-hearted new novel from Ava Dellaira, the author of the critically acclaimed LOVE LETTERS TO THE DEAD. Because the missing pieces always matter . . .
Marilyn is in search of freedom. She grew up as a child actor, her mother's meal ticket out of mediocrity. But it's been a long time since she booked a job, and she and her mother have no choice but to move in with her volatile uncle. Marilyn is counting down the days until she can escape to college, and the promise of her own future. That is, until she falls in love with James, the boy downstairs, who shows her that her life is worth living in the present. At 17, Marilyn is about to learn that everything can change in an instant. Angie is in search of answers. She is mixed race and has never met her father, but she knows she looks and thinks a lot like him. Though Angie grew up with her devoted mother, Marilyn, she's always felt the absence of the man she never knew. But after discovering that her mother has been lying to her, Angie sets off on a road trip to Los Angeles, in search of an unknown uncle - and maybe even her dad. 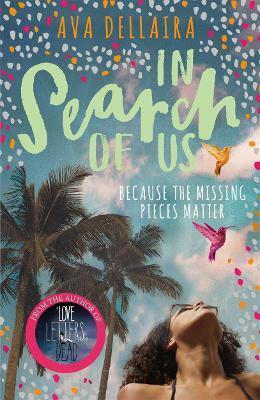 At 17, she hopes to finally find out the truth about where she came from so she can discover who she truly is. Told in two perspectives, Marilyn's in the late 90s, and Angie's today, IN SEARCH OF US is a sweeping inter-generational story about mothers and daughters, love and loss, holding on and letting go.